Quilts ready to be released into the wild. 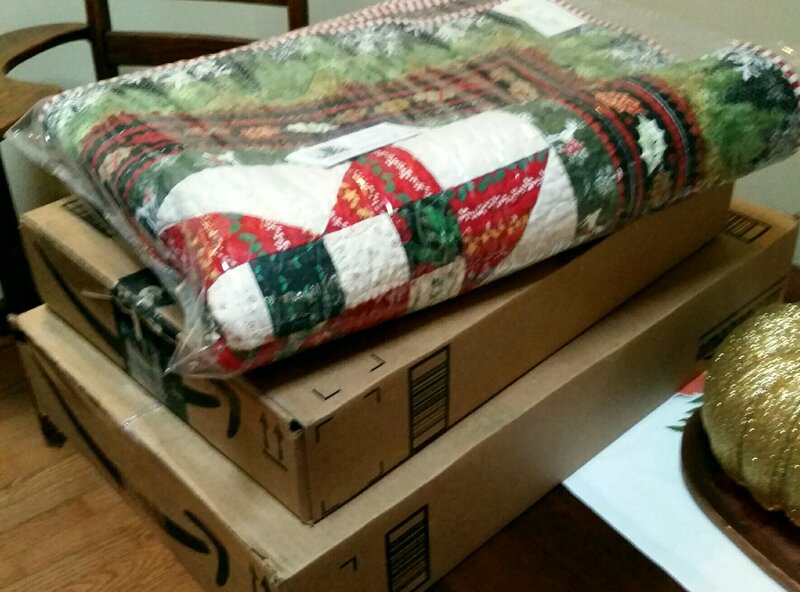 Yesterday I worked at boxing up quilts to head to new homes. I have a couple more that need a box and an address, respectively. 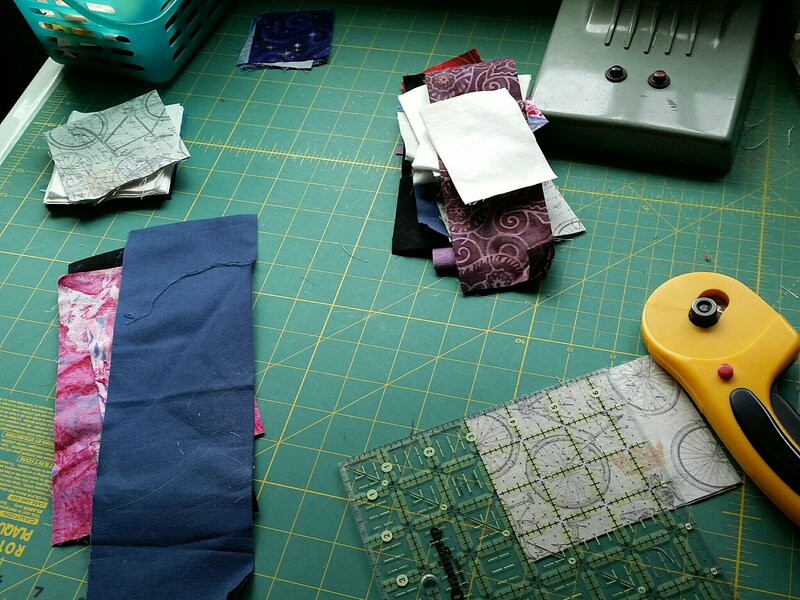 Today I cut the scraps, put away fabric, put away the extra table, vacuumed, and just generally dug out from this month’s flurry of piecing and quilting. Keep warm and use your stash! After pushing hard for a few days, I’ve finished quilting the flying geese quilt. There are lots of straight lines from the walking foot, and then I added this pattern to fill in the negative space. It’s from Shape by Shape by Angela Walters. 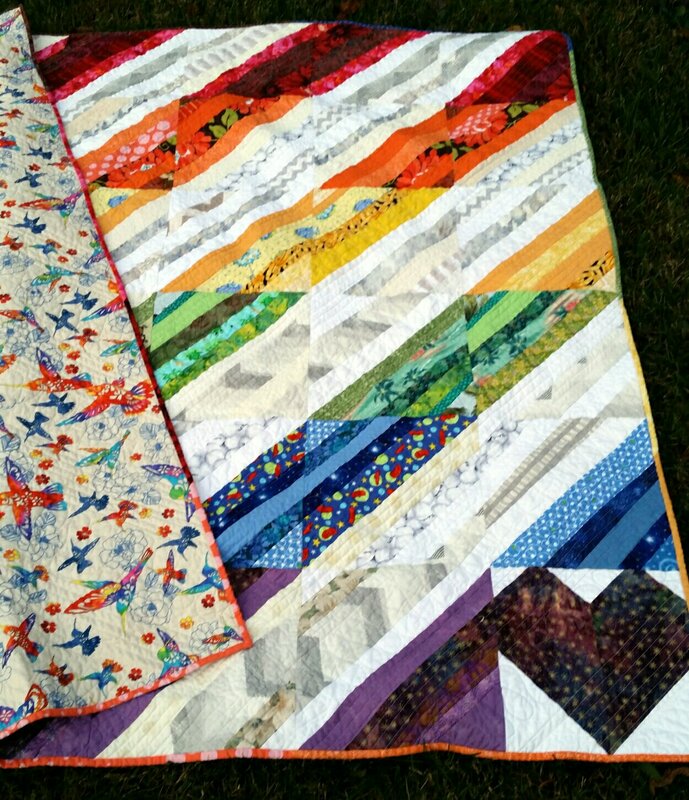 That last piece of fabric finally arrived, and I was able to complete the flying geese blocks for the custom quilt. The top is all sewn together now. Quilting tomorrow. 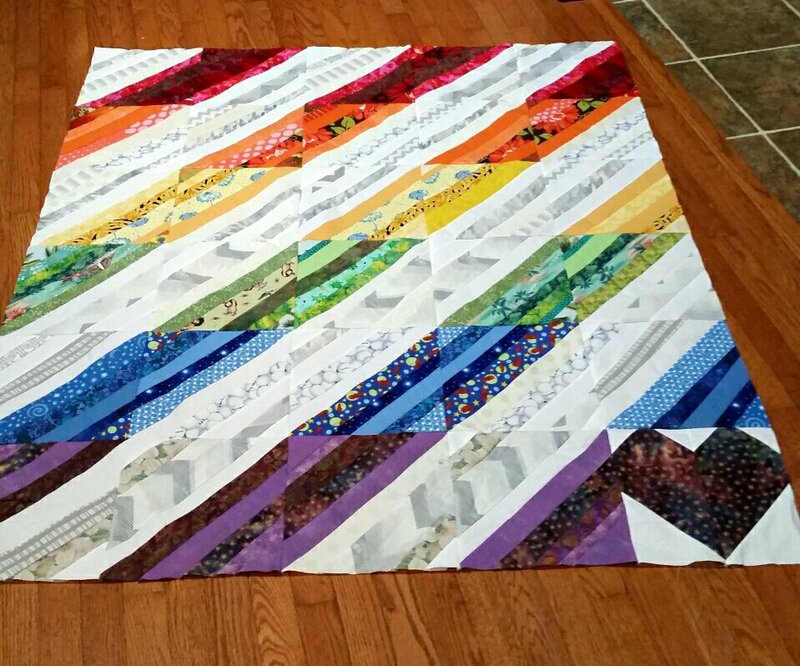 In the meantime, I finished the rainbow quilt, #quiltsforvegas. 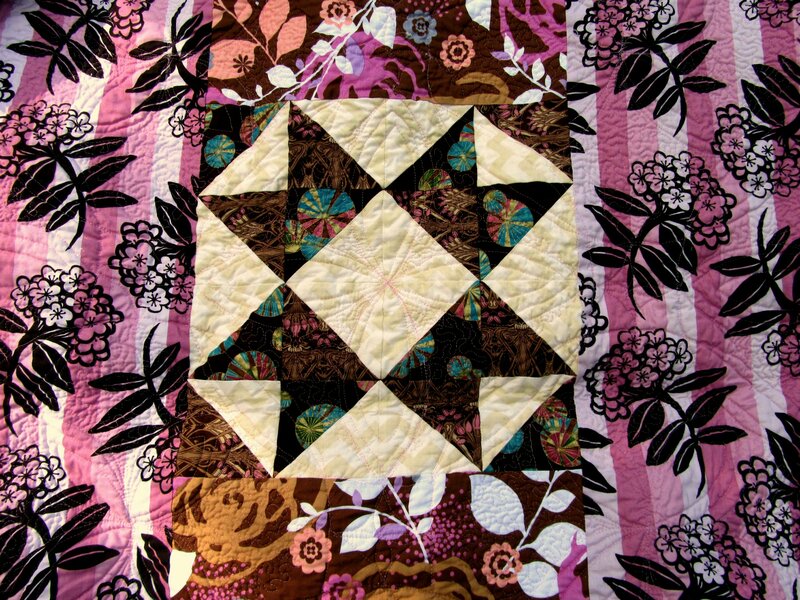 The quilting is straight lines and ribbon candy. 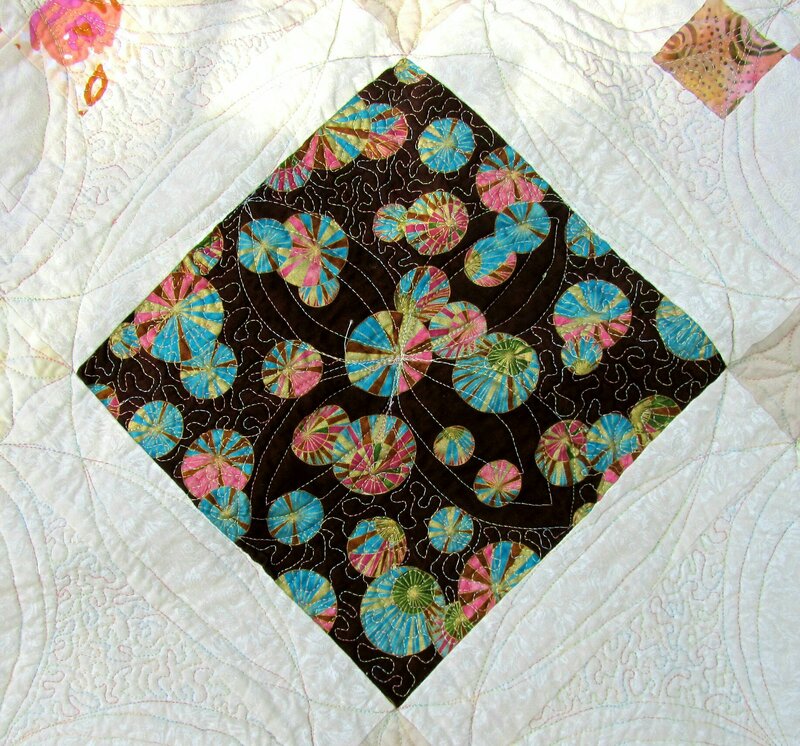 And I made the backing for Pacific Stars, so it will be ready to quilt next. I hope you’re making lots of progress on your projects! Everything is in progress, because I can’t finish anything! I’m waiting on fabric to arrive in the mail. One packet is fine and I’m sure it will be here soon and on time. Another, special order, piece seems to be lost in the mail and I’ve started making inquiries. 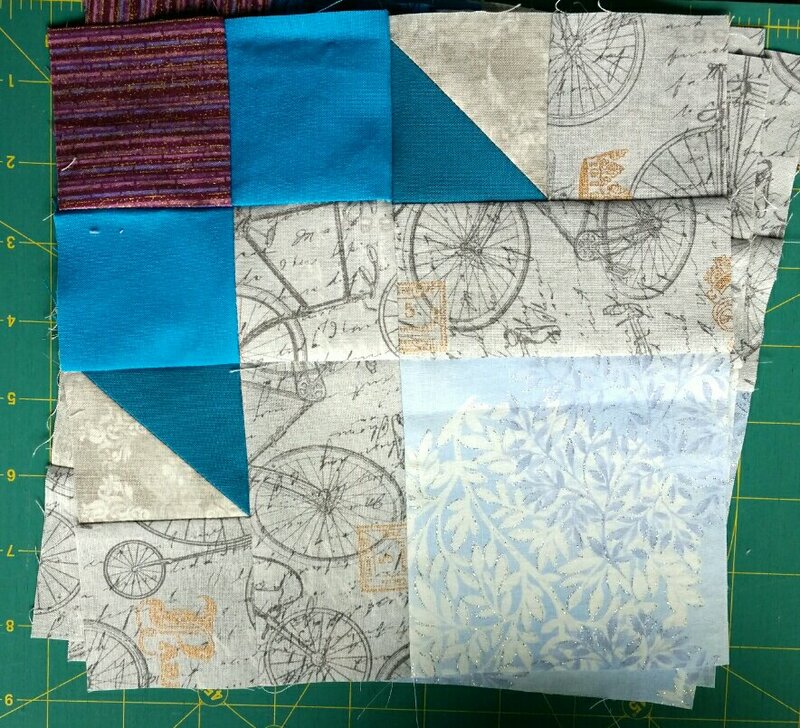 That’s the one I need to finish up this commissioned quilt that is stuck on my design wall. While waiting, I’ve made the back and the binding. 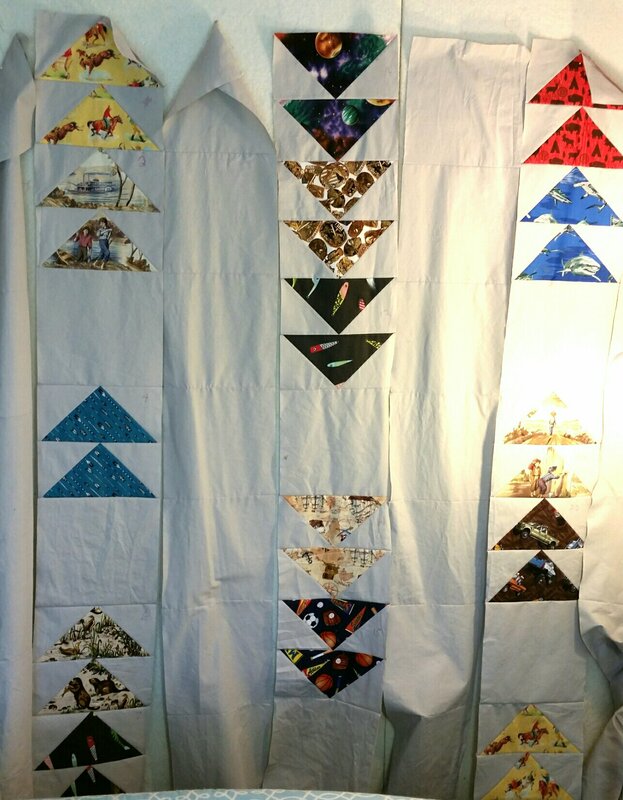 Still waiting, I made some string blocks and put together this #quiltforvegas top. 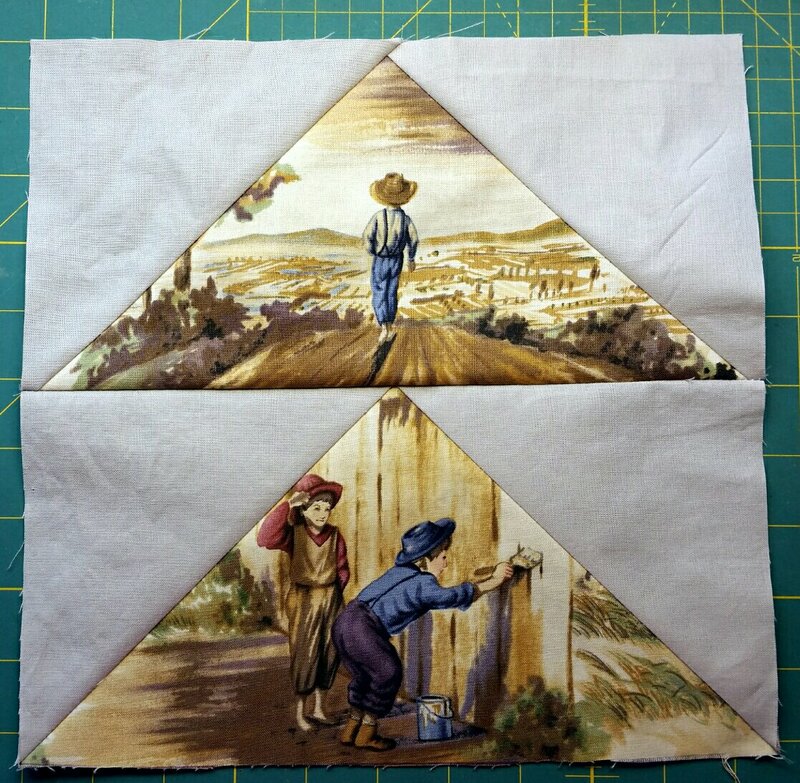 Here’s the post from the Las Vegas Modern Quilt Guild, calling for blocks and quilts. Also, Quilts of Compassion is collecting quilts for Houston. After I finished that top (backing is in the other package), I got out the Pacific Stars Mystery Quilt by Charlotte Scott (on Carol’s Quilts blog). I’ve now completed all the blocks and am assembling the top. It was mysterious until the end, and I like it! I hope you’re making progress and maybe actually completing something! I’m happy to show you this finished quilt! Layer Cake Explosion was the Twilter! 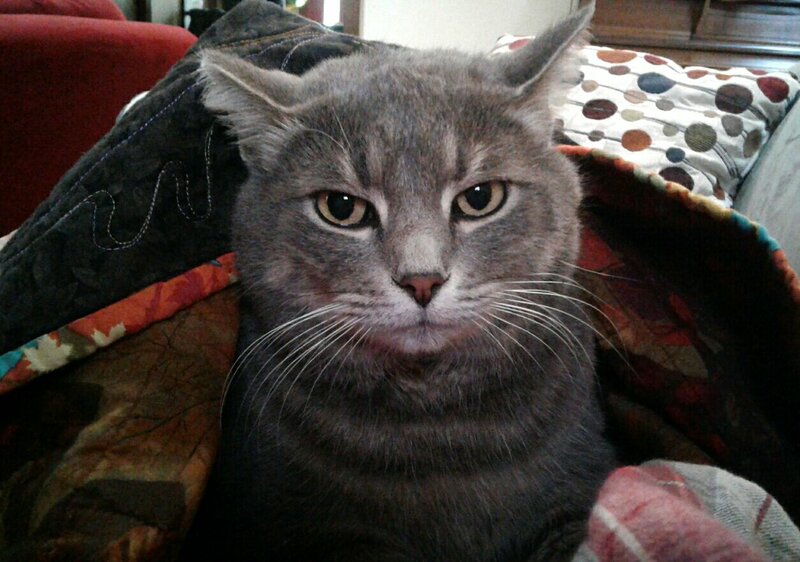 quilt-along. The design is by Angela Gross, and you can find it on Craftsy. 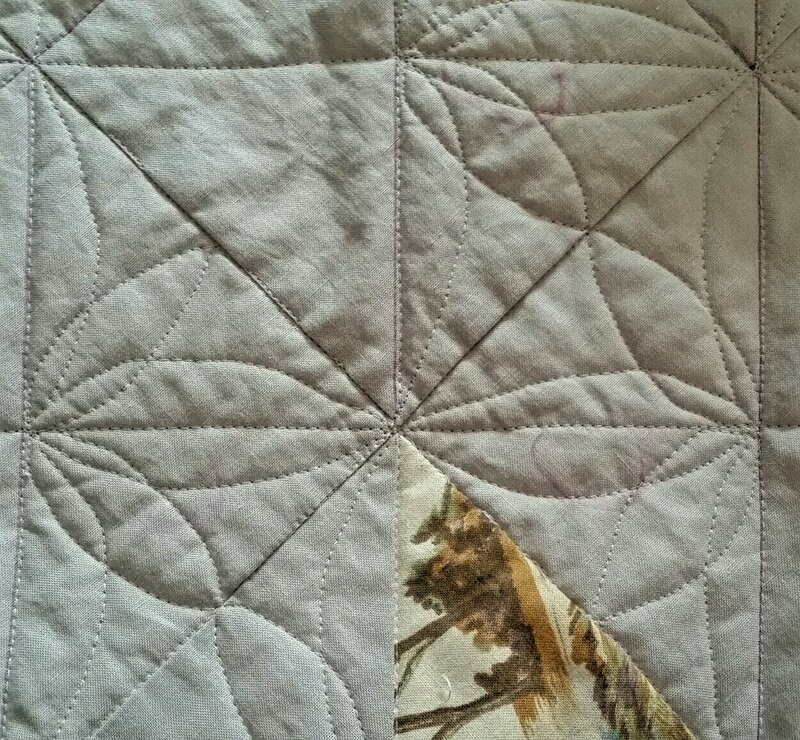 Because I used wider sashing, my quilt measured a whopping 93″ square, which was tough to cram under the machine. In a moment of particular lunacy, I thought how nice it would look with a double batting…but I quickly regained my sense, and went with just one layer (Pellon’s Nature’s Touch 80/20). This is a new batting to me, and it was fine, but didn’t seem a lot different from the Warm cotton I usually use. I did like the careful way it was folded in the package, which made it very easy to trim and position the large batting. Yes, it would have looked wonderful with double or extra puffy batting, but it’s just fine this way. Yuri checked. For once I feel like I did a good job designing the quilting. 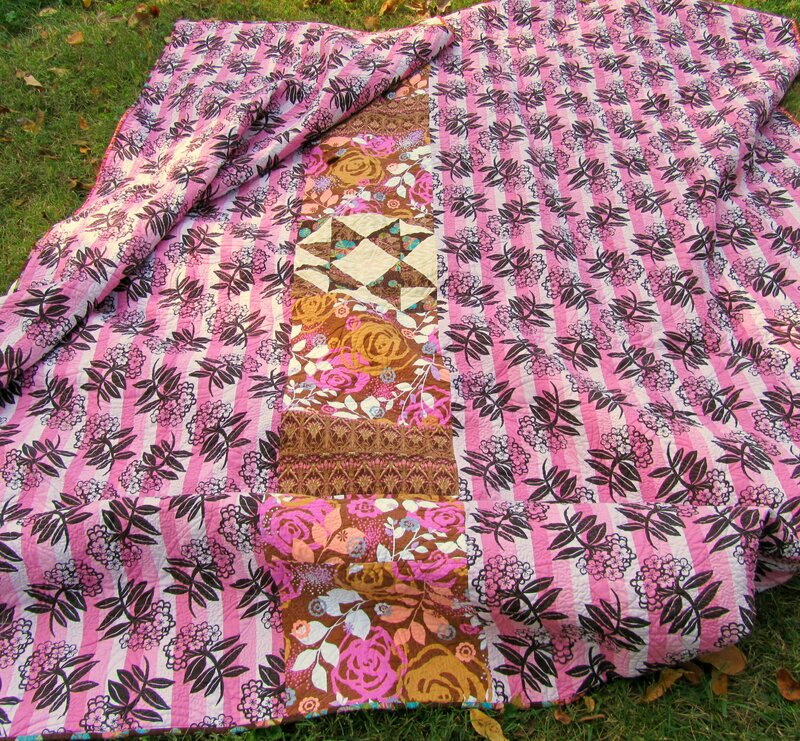 I was influenced by Wild Quilting by Christina Cameli, which I watched on the free Craftsy day. No, I didn’t do improv quilting like she did, but I got her message of echoing things to give them depth. So where I would usually have made one Orange Peel motif in a block, I echoed each twice. I also added a line to each of the border circles. All the quilting on the top is Superior Rainbows 9808, Opal) and the bottom is pink Bottom Line. 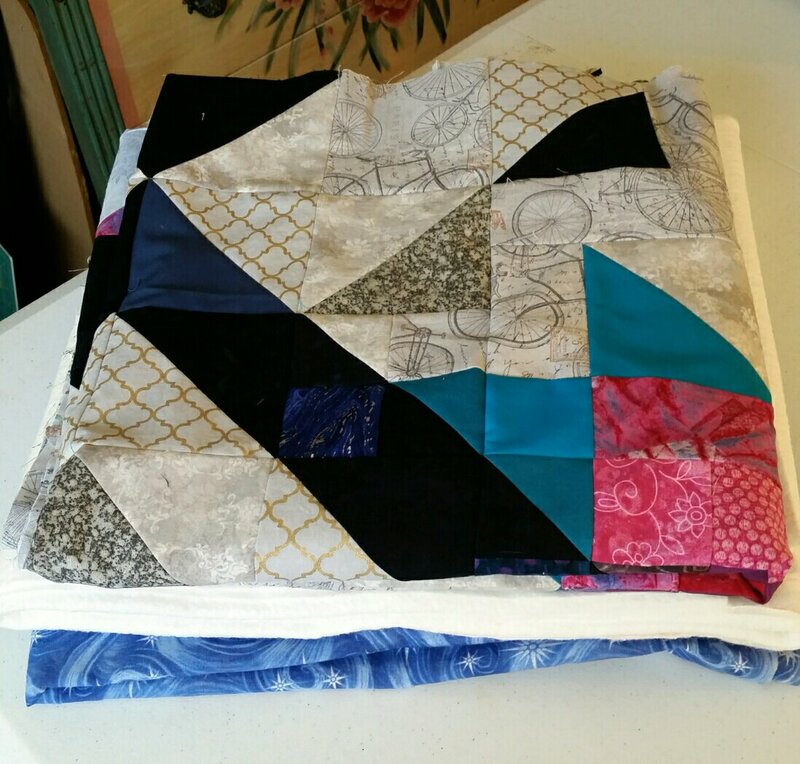 By including the sashing with each block, I was trying to quilt 11″ circles, just impossible to control on this bulky quilt. I knew that, but I wanted to try and I’m glad I did. Some of it is imperfect, especially near the center, but I still like the interlocking circles. The quilting improved greatly when I finally put on my quilting gloves. I hate them, they’re hot and itchy, but they really worked in this situation. 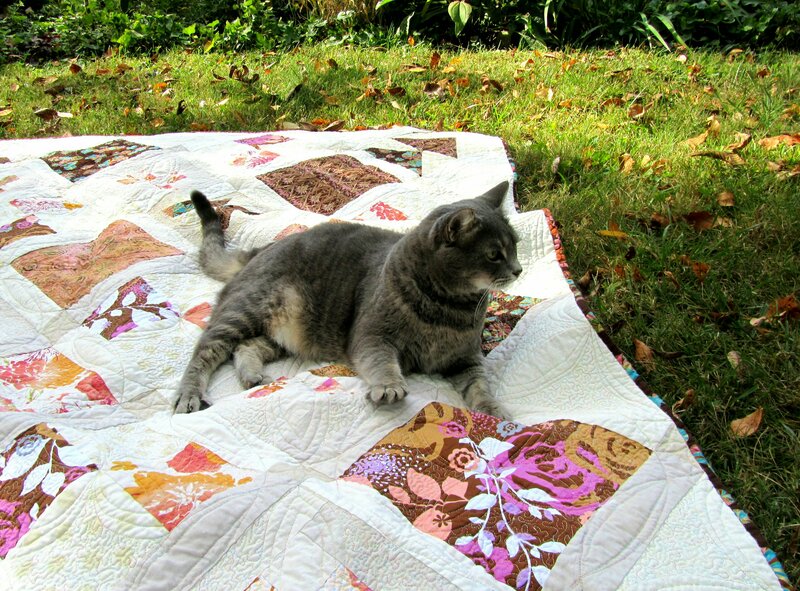 Allison at Cluck Cluck Sew posted just last week about quilting large quilts. 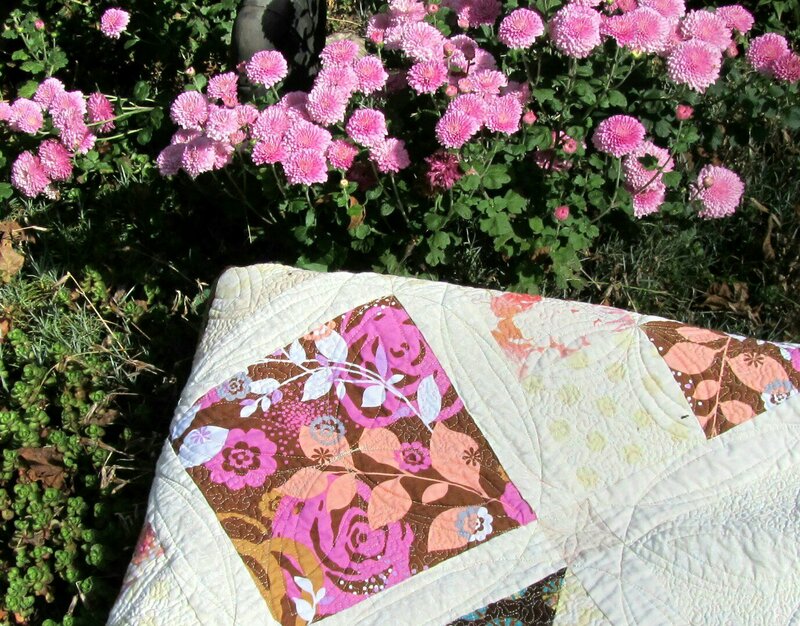 I agree with almost everything she says (especially about quilting-by-checkbook! ), except for spray basting. It really doesn’t take much to hold the quilt. You know that I usually use just a little, just barely wafting the spray over the layers. This time I was concerned about holding this large thing together, so I gave it an extra waft. (Still using that can I started in January.) I used my Ping Pong table, basting the center first, then moving it to baste each side. I couldn’t be more pleased with the way it held. I had no shifting and not a pleat or wrinkle on the back! 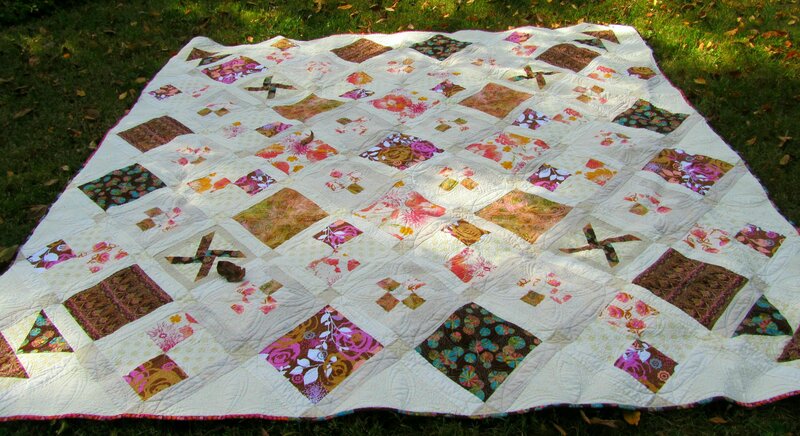 I used twelve bobbins of thread to quilt this. Speaking of the back, somehow this star landed perfectly in the center. Notice the quilting from the block on the other side. Could never do that again! 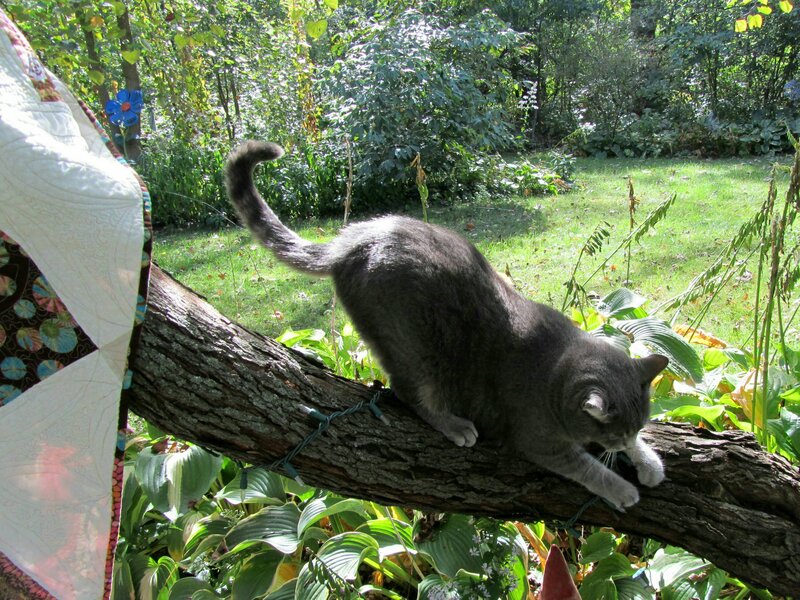 It’s important to have a quilt photography assistant who can climb trees. Thank you, Daisy for leading this project, and Angela for sharing your pattern. 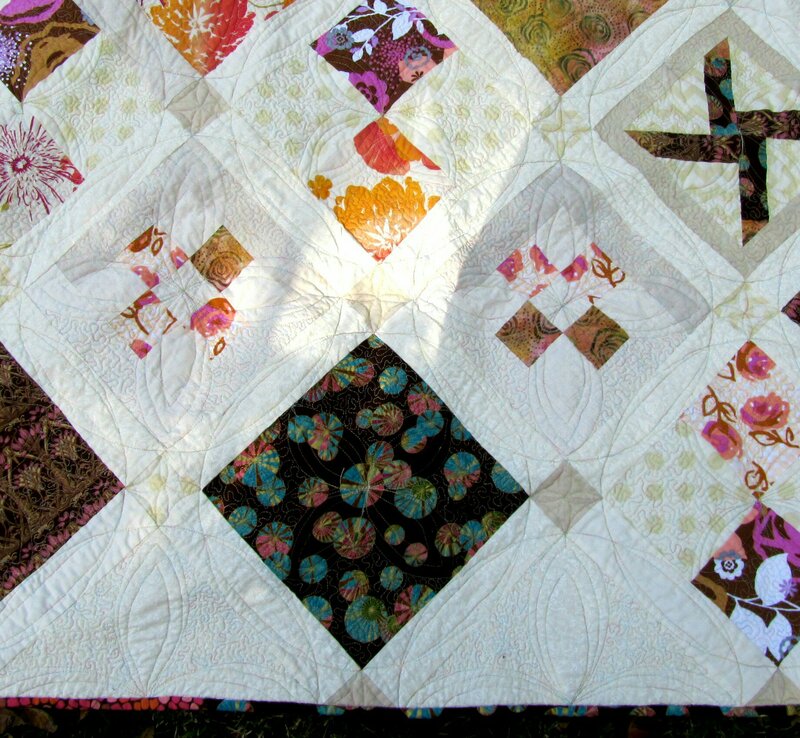 I’ll be linking up to Finish it up Friday at Crazy Mom Quilts, and Whoop Whoop Friday at Confessions of a Fabric Addict. Categories: Finishes | Tags: bottom line, Evening in the Garden, layer cake explosion, rainbows, superior thread, Valerie Root | Permalink. A finish! A post about Layer Cake Explosion in a few days. And… a large amount of fabric came in. It’s for a commissioned quilt, and I wish I could say that it will all go out again soon, but there will be lots left over that I will need to put to use. So. So, net destashing needs work, but I have used more than a hundred yards of fabric this year. I got on a roll after making the back for Layer Cake Explosion, and got it basted, quilted, and bound. This was a huge project (93″ square), so I don’t mind that I put off Pacific Stars. I’ll just be doing lots of work on that this month. Make last month’s Pacific Stars blocks. Make this month’s Pacific Stars blocks. 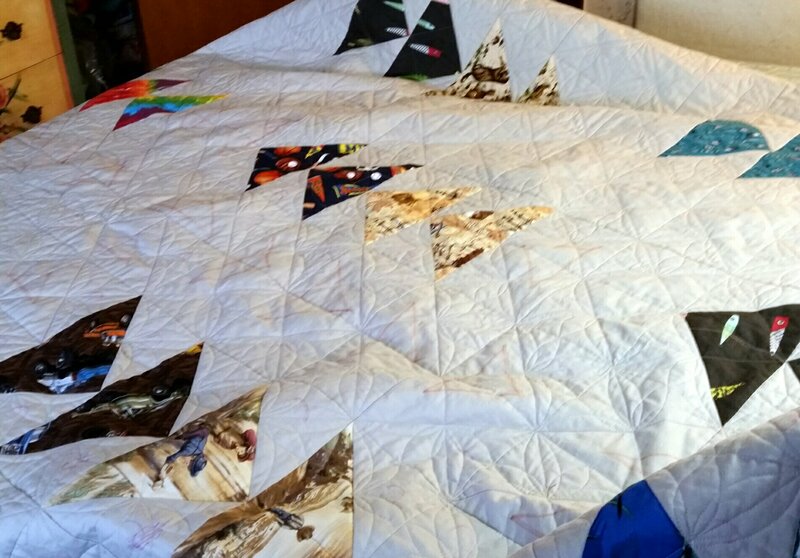 Make commissioned flying geese quilt. 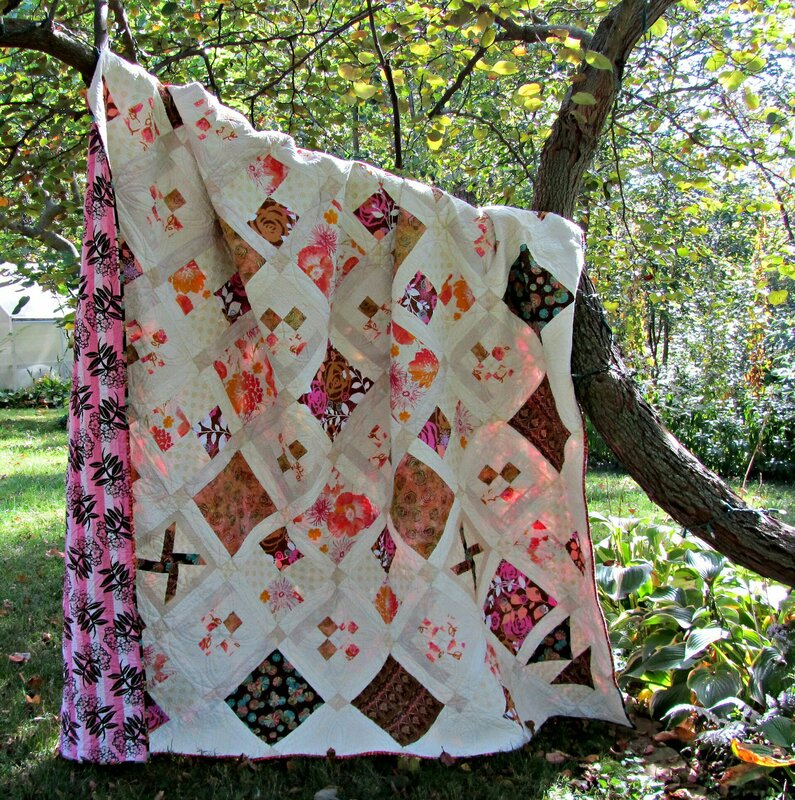 Donate some quilts that are hanging around. Good luck on all of your goals! Right now I’m feeling fortunate to have food, water, and power, and I hope you do, too. Categories: Stash | Tags: Evening in the Garden, goals, stash, Valerie Root, Yuri | Permalink.